NY9391 2380. Some 2 miles to the south-west of Middleton-in-Teesdale, County Durham, is the Lunedale Ridge close by Harter Fell. On top of the ridge, that can be seen for miles around, there is a tree-covered burial mound or round barrow, locally known as Kirkcarrion or Caryn’s Castle. It stands some 380 feet high. Access is by footpath from the B6276 Brough road. 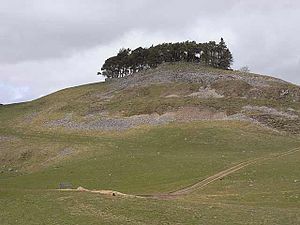 The prehistoric barrow is located in the middle of a clump of pine trees at the top of a rock-strewn hill known as Lunedale Ridge and, locally Kirkcarrion or Caryn’s Castle, after a Brigantean prince who was buried here in pre-Roman times, but it is much more likely that a Bronze-Age tribal chieftain was buried in the barrow. His or someone else’s ghost is still said to haunt the ancient citadel. In 1804 a local farm labourer removed some stones from the mound and uncovered a cist burial or sepulcharal grave, but not realising what he was doing he calmly took the stones away to build some walls on Crossthwaite Common. A funery urn with charried bones inside was found at the same time. The antiquities from the cist burial eventually came into the hands of the landowner, Lord Strathmore, who promptly took them to his castle at Streatlam near Barnard Castle, County Durham, where the artefacts were put on display. Another excavation was carried out in 1849 but there does not appear to be any record of what, if anything, was found at that time. Lord Strathmore built walls around the burial mound and planted pine trees as a mark of his respect for the ancient burial site. Today, the place is an atmospheric, mystical place; no doubt this was something that the ancient people found very much to their liking, a place where they could bury the chief of their tribe, a high place that was, perhaps, for them nearer to “their” god or gods. Categories: Burial Mounds / Round Barrows, Kirkcarrion Bronze-Age Burial Mound | Tags: Kirkcarrion Burial Mound at Middleton-in-Teesdale County Durham | Permalink.